Grand Tour of Morocco: 16 days with arrival / departure from Casablanca of the imperial cities, desert of Merzouga 4×4 and the sea. Rabat is the capital of Morocco. Your visit to the capital will begin by seeing the ancient walls of the old city which are more than 5 km long and were built on the order of Sultan Yacoub el-Mansour, giving the city a very special character that sets it apart. You will pass through the medina and its souks, more authentic than other stores because the products are targeted to local customers and therefore less touristy. You will then visit the kasbah of Oudaia, a terrible tribe of predators who lived there in the twelfth century. You will then visit the Hassan 2nd Tower where the 4 facades are decorated differently from one another, three are shades of pink and one is grey due to the sea breeze, the ruins of the old mosque and the mausoleum of Mohammed V are located next to the tower both are masterpieces of traditional Moroccan architecture full of high-quality materials from around the world and beautiful decorations. From here you will return to the new city to see the Royal Palace, the official residence of King Mohamed 6th and the adjacent necropolis Chellah, built in 1339 to house the tombs of the Merinid dynasty. 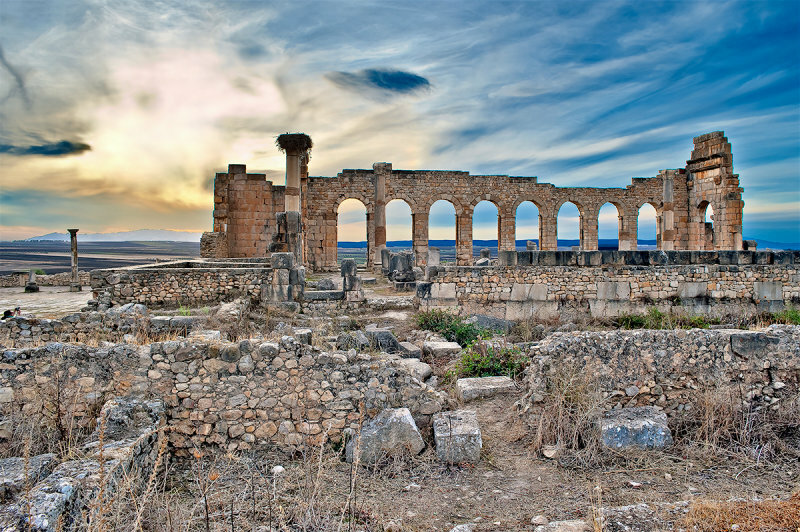 You will then head to Meknes, Meknes is the smallest of the imperial cities. You will begin your visit to this city at the Bab Mansour, the most important and significant of the gates of Meknes. You will then head to the Mausoleum of Moulay Ismail which is a very important site where tourists are asked to dress appropriately out of respect. You will visit the granaries of Moulay Ismail, this is a grain store and is one of the most important monument of the imperial city, built with walls of beaten clay mixed with stones and straw. We will then enter into the heart of the medina across the square El-Hedim and visit the market and souk. You will begin your day by touring the old city of Fez (Fes el-Bali) and its medina, the largest and most famous of the Arab world, entering from Bab boujloud which is a huge door and entrance into the old medina you will head towards Dar Batha, a Hispanic-Moorish building that houses a fine museum of folk art. You will then visit the Medersa mosque an old Quranic school in Fez medina where boys studied the Koran in classrooms where you will see its magnificent patio. The tour then continues through the tannery Chouara, you will discover the fascinating process of how the animals skins are treated and dyed, from the first clean-up to the hair colouring with the most beautiful natural colours. We will then go to the mosque of El Qaraouiyine, founded in the ninth century by a woman and thought to be one of the oldest universities in the world. The city tour ends passing through the square Seffarine, where coppersmiths and tinkers populate the square and adjacent streets. You will emerge from the medina through Bab Semmarine which is an exit from the medina that is located close to the site of the king’s palace. After breakfast you will head to the nearby city of Ifrane, nicknamed the'' Switzerland of Morocco'' where you can see the storks nesting on the roofs of the houses. You will have the chance to take a walk around Ifrane and see the local sites before setting of in the direction of Merzouga a small village in the Sahara Desert. 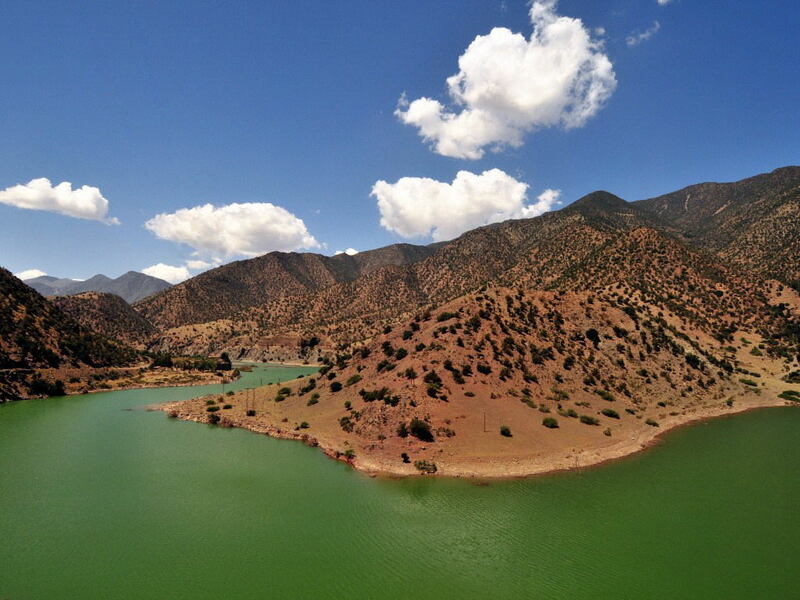 The first village you will see along the way is Azrou, which is of Berber origin, located in the heart of a national park of 53,000 acres on a limestone plateau surrounded by forests of cedars and oaks, in the midst of ancient volcanoes. Azrou is also famous for the presence of a large number of monkeys in the forest that surrounds it which you can stop and feed and get photos of. You will then take the road that climbs the Middle Atlas along the pass of Zad and on to the town of Midelt at 1488m altitude. Midelt is not particularly touristy but is famous from a geological point of view with crystal structures colourful and amazing located nearby. Here you can take a break for lunch. From Midelt the road goes through the beautiful gorge of Ziz until you get to Er-Rachidia, in the Southern Province. You will then continue on to the typical village of Erfoud where you will stay overnight. 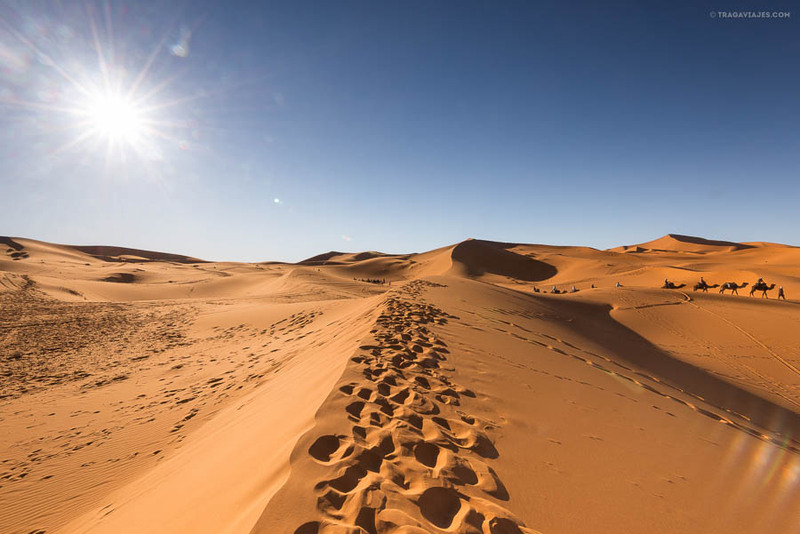 You will then arrive in Rissani, the gateway to the desert, and from there to Merzouga in the late afternoon to a traditional desert hotel with swimming pool, before sunset, you can make a wonderful walk around the nearby dunes of Erg Chebbi. 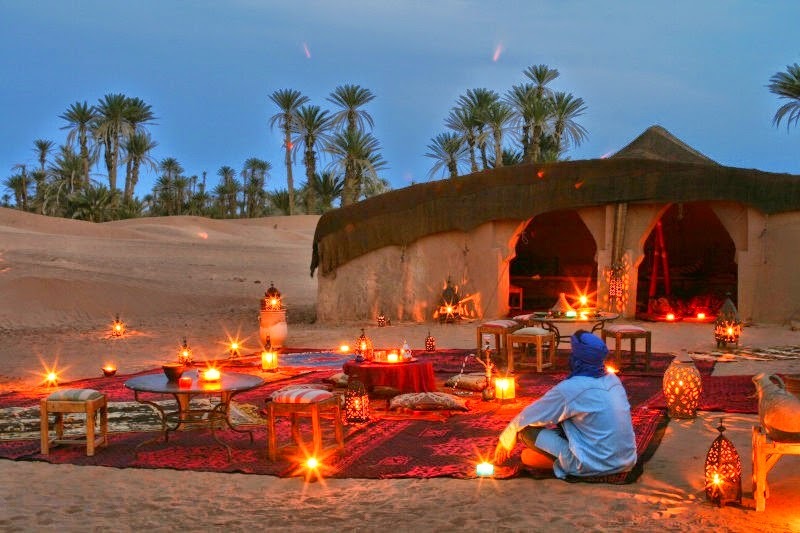 Here you will have a traditional dinner in front of the fire and to the rhythm of drums and songs of the Berber people, Tuareg and the south of Morocco. You will spend the night in traditional Berber tents in the desert. After breakfast and a refreshing dip in the pool you will take the 4x4 for a tour to some nearby caves where natural fossils can be found, then you will go to the small and ancient village of Tissrdmin where many movies have been filmed, taking the road which passes along the route of the famous Paris – Dakar rally. You will then pass through the Black Desert with its volcanic stones where we will take tea with a Tuareg family. Then you will arrive at the village of Kamlia, famous for its inhabitants from black Africa and their music. This village is also famous for the festival of music and dance that takes place every year during the first week of August. From here you will go to see the lake Dayet Srji with its pink flamingos. You will return then to Rissani where we will eat a Berber pizza for lunch with its 44 spices with a Tuareg family. You will get to see the local traditions and customs and you will see the items that arrive here with the caravans. 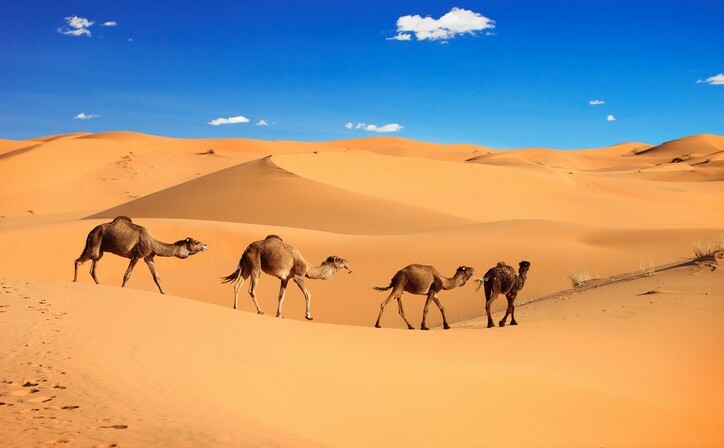 Rissani was once the economic capital of Morocco and the centre of the caravans leaving for the desert. You will then we will visit the Kasbah of this town before returning to the hotel to relax before taking the camels for a trek into the dunes. After a camel trek of about an hour and a half you will arrive at the Berber tents where you will watch the sunset and spend the night. Here the local guide will prepare for you a traditional dinner and then you can take a walk up the big dunes of 300m to see the stars, shooting stars, and if you are lucky even the Milky Way. Truly amazing! Wake up early in the morning to see the sunrise and the different colours of the dunes in the morning sun. You will then take the camel trek back to the hotel from where, after a shower and breakfast, we will resume the tour in the south. You will take the road to the Todra Gorge, where the film Lawrence of Arabia was filmed, one of the most beautiful areas of southern Morocco. Here you will also make a stop for lunch and from there you will head onto Boumalne Dades where we begin the 25 km long journey into the valley leading down to the gorge, where you will take a walk through the lush green vegetation in contrast to the surrounding red rock and where the local buildings have the same colour as the rocks. Along this valley is a whole succession of ksours in the heart of fields and orchards. From here you go again to the gorges of Dades. We will stop to have dinner and spend the night in a typical hotel. After breakfast you will travel to the valley of roses, by the route of 1000 Kasbah, where you will see many kasbahs, buildings that are typical for the south of Morocco. You will make a stop at the main town in the valley, El-Kalaa M'gouna famous for the blossoming of this flower from which the locals make many products for body care. From here you will head to Skoura to visit the kasbah of this area and take a break for lunch. 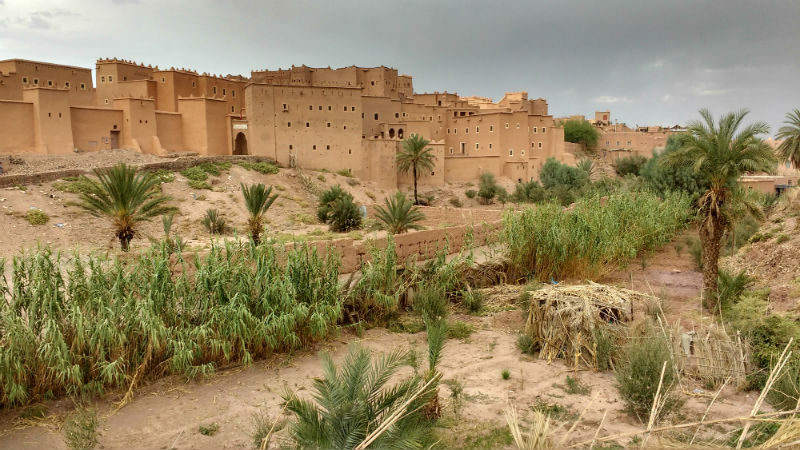 We will continue to Ouarzazate after lunch and visit the largest and most famous film studios in all Africa, the Atlas Studios, where films such as Gladiator and kingdom of heaven were filmed. You will then visit the kasbah of Ouarzazate Taourirt and then proceed to the Kasbah of Ait Benhaddou. Here you can visit this famous Kasbah, a UNESCO world heritage site and the scene of the filming for films such as Gladiator, Babel, Lawrence of Arabia, The Legionary, The tea in the desert and many others. 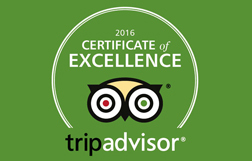 After dinner you will overnight stay at the riad. From Ouarzazate to Taroudant, this Berber town grew up around a market that is located in the southern part of Morocco. Noted for local crafts (jewelry, carpets etc) it has the charm of a small market town situated on the route of the caravans and 'particularly because it seems a little like Marrakech but far less chaotic. From Taraoudant you will continue on to Tafraoute, a delightful city that is sheltered from the hot African weather by granitic rocks that surround it, a spectacle of nature that allows you to experience this unique part of Morocco and this is one of the most spectacular roads in Morocco. You will continue along this route to Agadir. You will depart in the early morning to Essaouira. You will visit the ancient city of Mogador, this was the old name for Essaouira. You will start at the port, mostly devoted to fishing and one of the busiest parts of the city, you will see the large fish markets selling all kinds of seafood as well as the large square opposite where the fishing ships wait to head out onto the ocean, here you will find the local fishermen making ready their nets and preparing to set sail! From here you will also be able to access the upper parts of the old sea wall defences and visit La Scala. You will head down into the old medina where you will have a change to explore the maze of narrow streets filled with souks and markets.The afternoon will be free to go to the beach or take a stroll along the beach if the wind is not too strong. The beach is beautiful and stretches as far as the eye can see. For those who wish, you can also take a boat trip which lasts about an hour and passes the nearby island of Porpora. You will eat dinner and spend the night at a traditional riad. You will start by visiting the Bahia palace, or the'' beautiful'', the nickname of the favored abode of the rich vizier Ba Ahmed, built around 1880. From there to the palace Dar Si- Said also a splendid residence of the brother of the Vizier. Near these two buildings you can see the outside of the Mosque El-Mansour also known as the Mosque of the kasbah, easily recognizable thanks to its minaret with turquoise arabesques. You will continue with a visit to the Saadian tombs, the garden which belonged to the mosque of El-Mansour, who guards the tombs of the kings of this dynasty and family. If you are interested there is the possibility of going to a traditional Moroccan hammam in the afternoon and / or a massage with Argan oil. You will return to the riad for dinner. 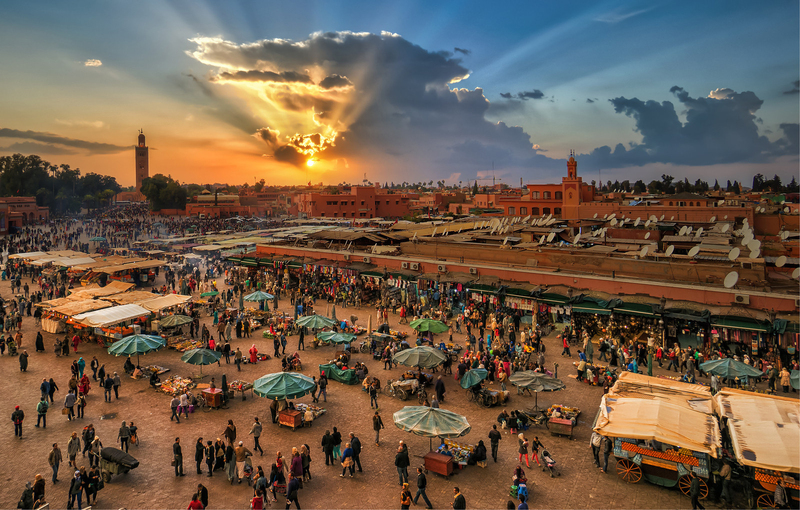 After dinner you will take a walk to the big square Jamaa el-Fna where you will find its characteristic street vendors which ensure a continuous show. You will meet fortune tellers, snake charmers, small groups of musicians, water carriers, and tattooists. You will spend the night at the riad. After Breakfast you will transfer to the airport according to your flight schedule, we will assist you during boarding formalities and wish you a happy return to your country.